Awarded by Earnshaw’s magazine, the Earnie Awards recognize outstanding children’s companies for excellence in business and design. For 41 years, the magazine has gathered votes from thousands of retailers and brand executives across the U.S., to honor manufacturers in a broad range of categories. There are two phases of the awards: the nomination process and the voting process. During June through July, retailers and manufacturers nominate deserving companies in each of the categories. After the nomination process, a ballot is established reflecting the industry’s top three selections in each category. Then, on Aug. 5, the voting process begins to select one winner in each category. Earnshaw’s tabulates these results and announces the winners in early October. As one of the oldest and most respected trade magazines in the country, Earnshaw’s has proudly served as the voice of the children’s fashion industry for 101 years. 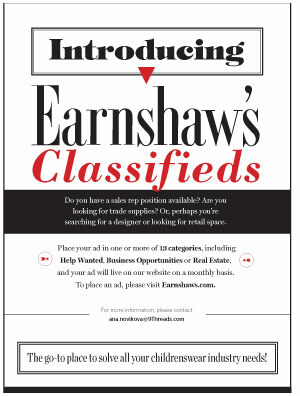 More than 15,000 retailers and brand executives rely on Earnshaw’s, both in print and online, to hone their retail strategies and merchandising techniques, keep their assortments fresh and stay informed on the latest trends, technology and industry news. Award-winning, influential and insightful, Earnshaw’s maintains its legacy as a comprehensive, accurate and respected industry resource. To learn more, visit Earnshaws.com.